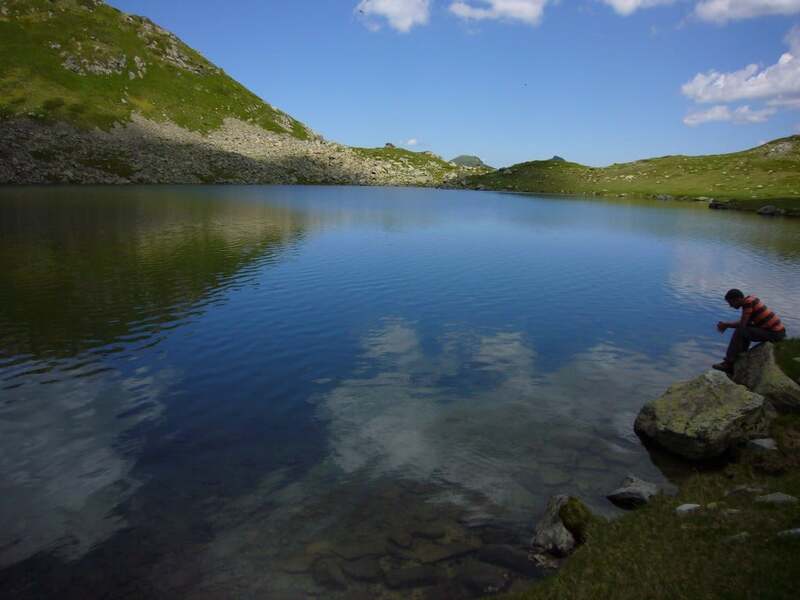 Enjoy the best of Albania’s natural beauty. 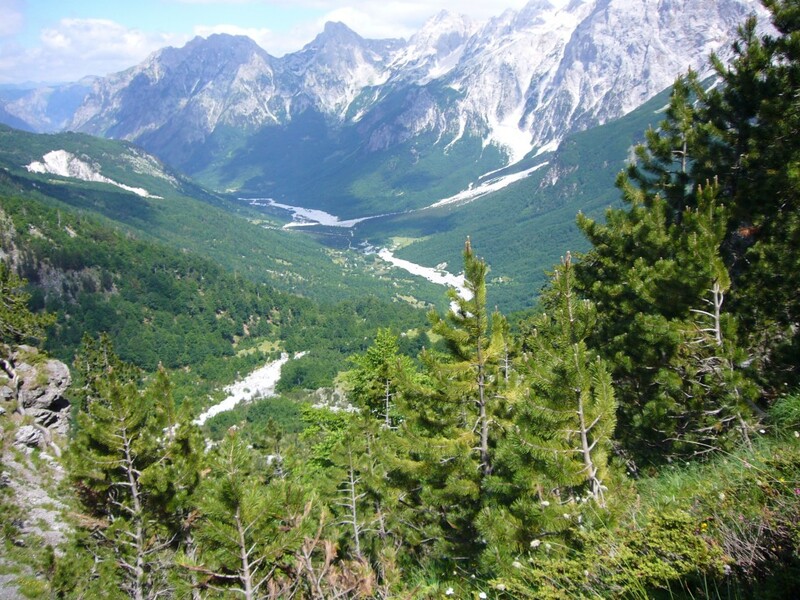 Explore the Theth, Valbona national parks, as well as the Gashi River Reserve. 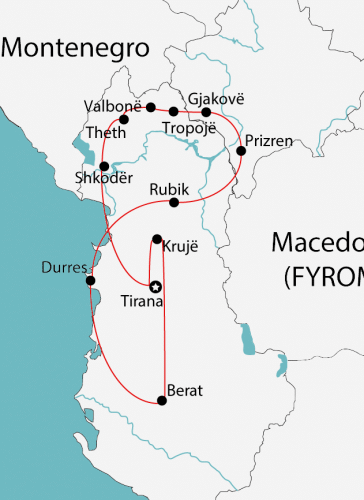 In addition, this 9-day tour will take you through the historic towns of Prizren, Berat, Durrës, Kruja and Tirana. The group will be welcomed by the Albanian travel agency representatives at the airport in Tirana. Next we transfer from the airport to the hotel in Tirana. In the afternoon we will visit Tirana’s highlights, including Scanderbeg square, Et’hem Bey mosque, Toptan Castle, and the Pyramid. To end the night, we will eat dinner at a restaurant reserved for us. Breakfast in Tirana. Travel by minibus from Tirana to Theth. Along the way, we will stop in Shkodër to visit the Castle of Rozafa and the renovated center. When we arrive in Theth, we will take a short break then walk through the village for around 3 hours. On our walk we will see the historic “Tower of Isolation” and the Franciscan church. We will spend the night in village guesthouses. Breakfast in Theth. We will walk to Valbona through Valbona pass with our luggage following by horse. 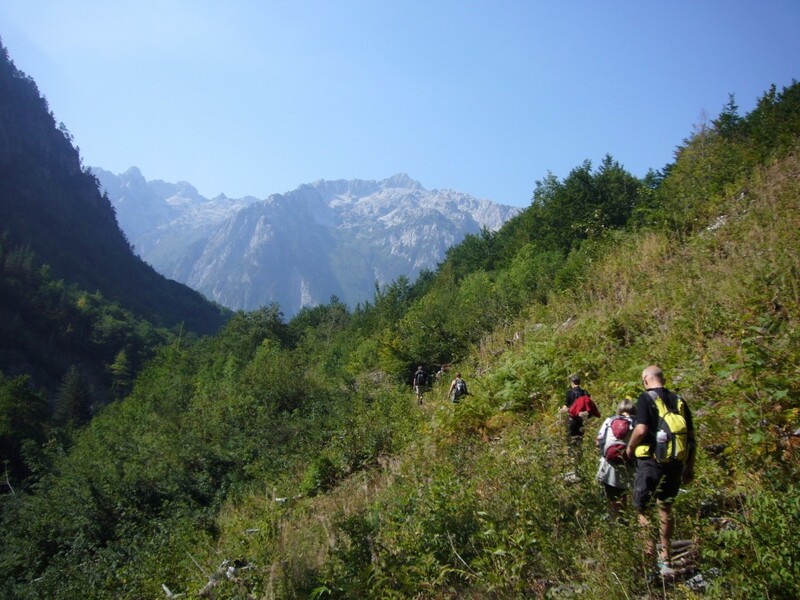 On the way we will see the Valbona water springs, waterfall and the village of Rragam. In Valbona we will enjoy a traditional folkloric performance. Overnight in Valbona. Breakfast in Valbonë. Today we travel by minibus up to the village of Çerem. From there we will begin walking to the Mullafci Alpine Pastures, passing though the Gjarpri and Kunji i Armeve pastures along the way. We will spend the night in in huts in the village of Mullafc. Breakfast in Mullafc. We hike along the National Park of Gashi River following the trail from Mullafc through Herushte and Bradozhnice, and finally to Begaj. This area is considered a protected reserve park and is filled with unique flora and fauna. From Begaj we continue by minibus to Tropoja village where we will spend the night. Breakfast in Tropoja. 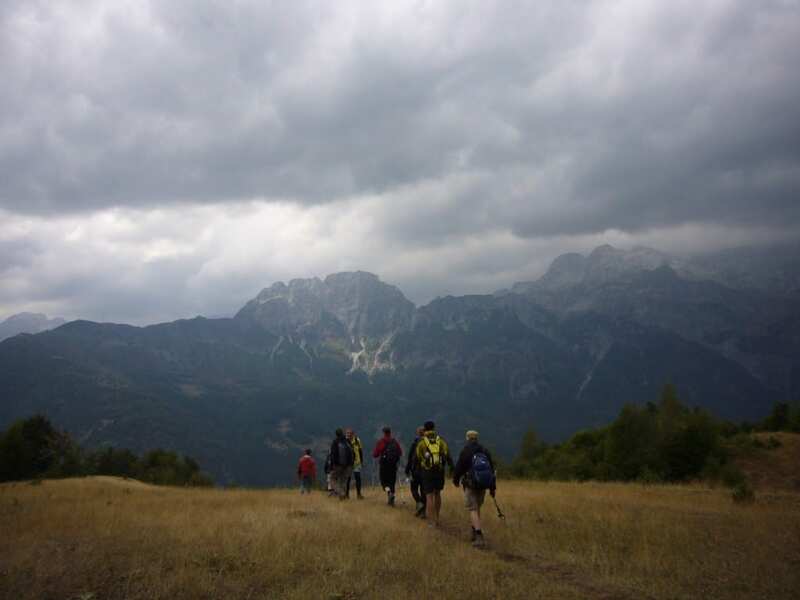 Today we walk along the border-crossing trails between Kosovo and Albania. The walk will take us through the Yugoslavian military check point and on to Kosovo. After a coffee break we will visit the city of Prizren. In Prizren we will visit the Sinan Pasha Mosque, the Turkish Hamam, and the Memorial of “Albanian League of Prizren”. The journey continues to the village of Katund i Vjeter near Rubik in the Mirdita Disctrict. We will spend the night in Rubik. Breakfast in Rubik. We make a short visit today to the village of Katund i Vjeter. We will have the chance to visit a local family and drink raki, a local alcoholic drink. After our walk we drive to the ancient city of Durrës where we will visit the 2nd century BC Roman Amphitheatre. After lunch in Durrës we will resume driving to the UNESCO city of Berat. In the afternoon we will take a walk along Mangalem and Gorica quarters to soak up the Ottoman character and feeling of this place. Photo stop in the characteristic neighborhood of Mangalem. Overnight in Berat. Breakfast in Berat. Today we visit the Ethnographic Museum and King Mosque in Berat. Next we will drive through Lushnje, through Vore and on to Kruje. In Kruja we visit the castle of Kruja and Scanderbeg Museum and have lunch in a restaurant nearby. Overnight in Kruja. Breakfast in Kruja. Today we walk up to Kruja mountain to visit the shrine of Sari Salltik, an important site for the Bektashi community in Albania. We will then transfer to the “Mother Teresa” Airport where our tour will end.